The fighter jet took off from Florennes AB to identify a civilian aircraft no longer in radio contact with ATC. First launch of a Belgian F-16 quick reaction alert intercept twoship under the BENELUX Air Policing arrangement in force since January this year. The mission is integrated into the overall NATO Air Policing in effect for all Allies. 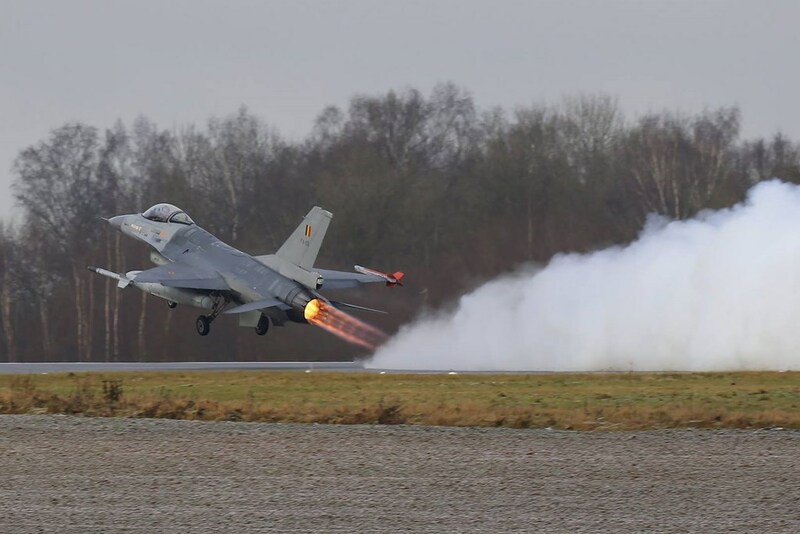 In the morning of March 7, a F-16 Quick Reaction Alert (QRA) twoship takes off at the Belgian air base at Florennes. The mission: to intercept a civilian airliner that is no longer in radio contact with Air Traffic Control (ATC) and identify whether there is a problem. Controlled by NATO’s Combined Air Operations Centre at Uedem, Germany and a Belgian national control centre at Glons the fighter jets launch to approach the airliner. Upon visual inspection it turns out a technical problem prevents the Hungarian airliner pilots from communicating with civilian ATC. The fighter pilots determine that the situation in the cockpit appears to be normal and use their special frequency to permanently relay the civilian plane’s position to the ATC. This allows the Hungarian plane to continue its flight toward British airspace while the F-16 jets maintain radio contact with the ATC all the time. Meanwhile two Eurofighter Typhoon jets from Royal Air Force Coningsby – the British QRA – are launched to prepare for a handover-takeover of the airliner with the Belgian F-16 fighters. This joint NATO, Belgian and British venture allowed the safe landing of the civilian plane at its destination without causing a risk to other air traffic. NATO Air Policing is a peacetime 24/7 mission collectively executed by national air forces under NATO control ensuring safety of civilian air traffic 24/7.